Regular readers of this blog will know that early this summer we launched a unique inter-office encouragement system called KudoBot. You can read all about it here but, in a nutshell, if anyone in the company does anything you think is cool, you can log into our internal system and give them Kudos. Every morning, an automated e-mail goes out to the entire company with a digest of the prior days’ Kudos. It’s a great way for everyone to see all the good work that’s getting done across the company. While we had no idea what the “reward” for getting Kudos would be when Evan and Gregg started the experiment, that was all cleared up last Friday at an All Hands team meeting, when “THE WHEEL” was unveiled. 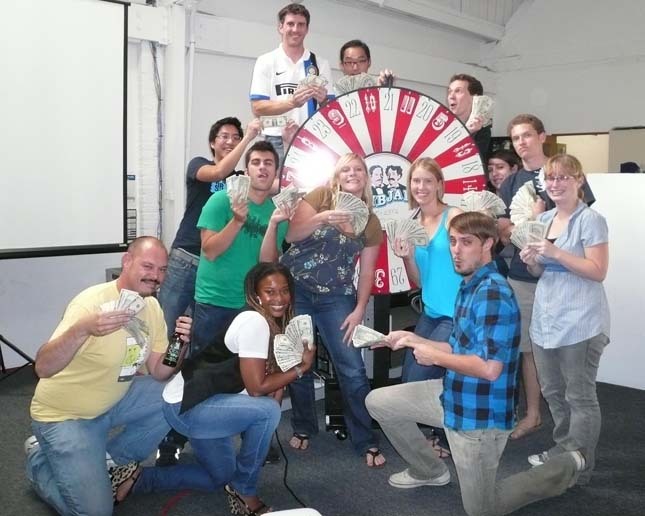 Our genius lead designer, Will, created a gorgeous carnival style spinning wheel and the top 10 Kudo recipients (+3 special mentions) were invited to spin the wheel for cold hard cash! The wheel is numbered 1-30. The first spinner (the #10 top Kudo recipient) multiplied the number they land on by $1. The second spinner (the #9 Kudo recipient) multiplied the number they spin by $2, the third spinner by $3, all the way up to the #1 Kudo recipient who could potentially spin a 30 and pocket $300 clams! To the dismay of Gregg and Evan, most people spun high, leaving this group with a solid amount of green! Congrats to all the Kudobot cash winners! This entry was written by paulhanges and posted on August 5, 2009 at 6:20 pm and filed under Inside JibJab, Team JibJab with tags kudos wheel. Bookmark the permalink. Follow any comments here with the RSS feed for this post. Trackbacks are closed, but you can post a comment.